The conference in Ontario is billed as "Fatima: The Path to Peace" but it features New World Order conspiracy theorists,holocaust deniers, racists, and an openly fascist speaker. (Video below.) 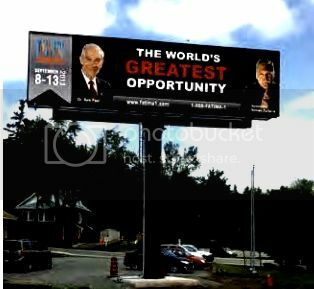 Former U.S Congressman Ron Paul will keynote the week-long international summit to be held in September at Niagara Falls, Ontario. The billboard at right, advertising the event, is at the Peace Bridge entrance to Canada from Buffalo, New York. Paul is accustomed to sharing the stage with conspiracy theorists - John Birchers, Christian Reconstructionists, and Neoconfederates - but this time it's the international summit of a radical Catholic traditionalist organization. The Fatima Crusaders not only reject the reforms of Vatican II, but also teach that the Vatican is in collusion with the United Nations to form a one-world government. This article includes short bios of some of the scheduled speakers and video of one of them rallying a crowd in Europe against homosexuals and Jews. Come back to Talk2action.org next week for another installment on Ron Paul and the John Birch Society's previous involvement with this same organization. The organization's adherents share the belief of apocalyptic-minded Protestants and secular conspiracy theorists that the United States is being punished for its disobedience to God and descent into Marxism. The Fatima Crusaders believe that the world can be saved from destruction if the request revealed by the Virgin Mary to three Portuguese children in Fatima in 1917 can be fulfilled - a mandate to "consecrate Russia to the Immaculate Heart of Mary." A 64-page publication on the conference explains the Fatima Center's mandate and includes bios of the speakers. One of the speaker's participating in the widely advertised international summit is Roberto Fiore, leader of Forza Nuova or National Front, an Italian far right party. Fiore, a mentor to British National Party's Nick Griffin, is self-described as a neofascist. His party is opposed to immigration, abortion, homosexuality, and capitalism. It's working for the "recovery of Christian religiosity" and to repeal the Mancino and Scelba laws which ban symbols, slogans, and gestures of Italian fascism and Nazism. In the video embedded below, Fiore is rallying a crowd in Budapest against Jews and gays. Fiore had been invited by the HVIM, a racist and nationalist Hungarian organization, to speak at the 2008 commemoration of the anniversary of Hungary's 1956 uprising against communism. The transcript is below the video. The statements in English by Fiore are repeated by a Hungarian interpreter. "And these are the same people who are trying to push gay rights, who are trying to push homosexuality, who are trying to push the destruction of the nation. And I here that this year you have opposed the gay march as in 2000 we opposed the gay march in Rome that tried to march near the Vatican, just to insult Jesus Christ and Christian civilization. This is the financial capitalism that is pushing thousands and millions towards poverty but it's led and it's directed from the same people who put Christ on the cross. But it's also fact that as in Italy, as in Hungary, it will be the people who will actually destroy this attempt to kill our nation and our civilization." Mario Borghezio, a Northern League (Lega Nord) Euro-MP known for blaming the mass killings by Anders Breivik on "multi-racial society" and for slurs about Italy's first black government minister. Borghezio was convicted in Italy of arson for setting fire to pallets of sleeping migrants. Robert Sungenis, described by the Southern Poverty Law Center as one of the most "open anti-Semites in the entire radical traditionalist movement" has denied that six million Jews could have been killed in the Holocaust. John Vennari, head of Catholic Family News and author of The Permanent Instruction of the Alta Vendita, a booklet claiming that Jewish masons have been invading the Catholic church since the 1700s. As noted by the SPLC, Vennari's CFN conference vendors have marketed The Protocols of the Elders of Zion and Hilaire Belloc's The Jews. Michael Matt, editor of The Remnant, a publishing arm of the radical traditionalist movement. According to the SPLC, The Remnant is source of numerous articles attacking Masons, Jews, and others, including a 2005 series by Sungenis titled "The New World Order and the Zionist Connection." G. Edward Griffin, described in his bios as "the pre-eminent anti-NWO scholar," author of The Creature from Jekyll Islandclaiming a Rothschild/Federal Reserve conspiracy and endorsed by Ron Paul. Griffin claims cancer continues because of a conspiracy of the pharmaceutical and medical world and that the Council of Foreign Relations engineers control of the world with only 4000 people. Barbara Skurnowicz, Eagle Forum's "National Leader for Vaccine Information" and warrior against mandatory vaccinations. John Salza, columnist at The Remnant newspaper and author of Masonry Unmasked, Why Catholics Can't Be Masons. Christopher Ferrara, lawyer for parents of Terri Schiavo and co-author with Thomas E. Woods, Jr. of The Great Facade: Vatican II and the Regime of Novelty in the Roman Catholic Church. The book was published in 2002 by The Remnant Press, the publishing arm of the "counterrevolution" of traditionalists. Cornelia Ferreira, author of books warning about a "Masonic New World Order" conspiracy of Illuminati, environmentalists, feminists, and evolutionists. The host of the conference is the Fatima Center, one of the organizations described as radical Catholic traditionalist groups by the Southern Poverty Law Center (SPLC) for their promotion of anti-Semitic and other conspiracy narratives. The SPLC is careful to isolate and distinguish these 12 organizations from the larger body of traditionalist Catholics who reject the reforms of the Second Vatican Council. Most of the Catholic speakers at the conference are affiliated with organizations that are included in SPLC's report on the "dirty dozen" and more information can be found there on many of the speakers. The conference is hosted by Father Nicholas Gruner's Fatima Center, advertised as "the largest Fatima apostolate" in the world, and by the Archbishop Emeritus of Cuddalore and Pondicherry, India. Gruner's standing in the Roman Catholic Church is challenged and he is not considered part of his local Catholic diocese and therefore claims to have legitimacy through Catholic hierarchy in India. The Fatima Crusaders teach that the idea of separation of Church and state "is a falsehood introduced by the enemies of the Church, the Freemasons" and that "no true Catholic can promote the false anti-God idea of separation of Church and state." This is not the first time that Ron Paul and the John Birch Society have teamed up with the Fatima Center's Nicholas Gruner and other radical Catholic traditionalists. Come back to Talk2action.org next week for the rest of the story. John McManus's presence at this conference certainly calls the JBS denials of anti-Semitism into question. Now what was that about lying down with dogs and getting up with fleas?